SILICON SLOPES, Utah – March 22, 2016 – Today at Domopalooza, Domo launched the Domo App Publisher Partner Program to provide the tools, best practices and support necessary to create an ecosystem of business management apps for the Domo Appstore. The program was introduced today with more than a dozen publishers on board. Core to Domo’s App Publishing Partner Program are new developer tools including Domo’s software development kit (SDK) and Domo App Builder, both now available. These tools, along with Domo’s open APIs, make it simple for anyone to build and deliver apps for themselves, for the Domo Appstore or for their own customers. Today, Domo also announced a new investment program that will seek to commit up to $50 million in capital to compelling companies making a big bet on the Business Cloud via the Domo platform and Domo Appstore. Teaming with Domo on this fund are leading venture capital firms GGV Capital, IVP and Zetta Venture Partners. For partners, the sophistication and ubiquity of Domo’s platform for connecting to and preparing data eliminates some of the most complex components of software development. “As a venture capital firm focused firmly on investing in companies creating the intelligent enterprise, we couldn’t be more bullish on bringing solutions to market that help businesses make better use of their data and analytics,” said Mark Gorenberg, managing director of Zetta Venture Partners. 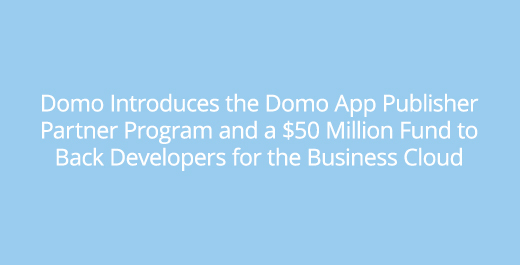 For more information, visit Domo’s App Publisher Partner Program.